Just recently, Clip Studio Paint Ex is released for the iPad Pro. It is both good news and bad news for many ClipStudio Paint user. But it comes with a downside: it is on a subscription basis: SGD11 per month in Singapore. Many of my friends did not welcomed this but rather wished that they could purchase it at one cost. However the app is free to use for 6 months once you subscribed to it. Another artist said you can unsubscribe it anytime when you are done saving the file. I have yet to try but this sounds like a great idea. So I downloaded it and imagined myself working on my comics project off the desktop for once. 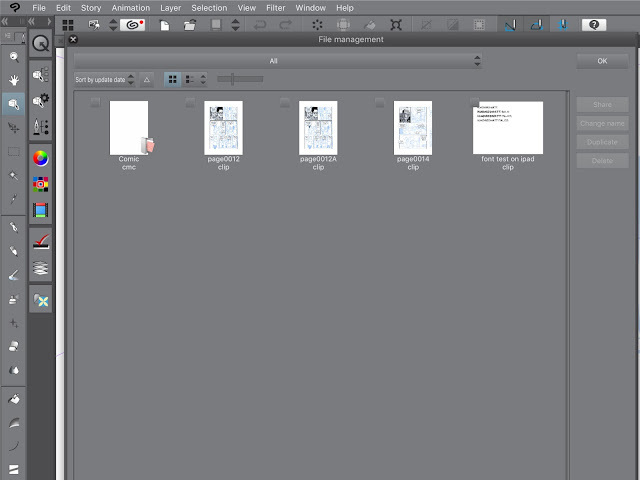 The User Interface looks exactly the same as the desktop version. I have yet to try changing the position of the tool sets. My question: How am I suppose to import my existing working files from the iMac to the iPad, and then back again. The solution is simple. Since my desktop and iPad is sharing the same wifi connection in the studio, I could use Apple Airdrop to transfer files, just by dragging and drop to the folder. I use the same method to transfer all other files back and forth iPad and iMac, same with folders, Keynotes, and etc. 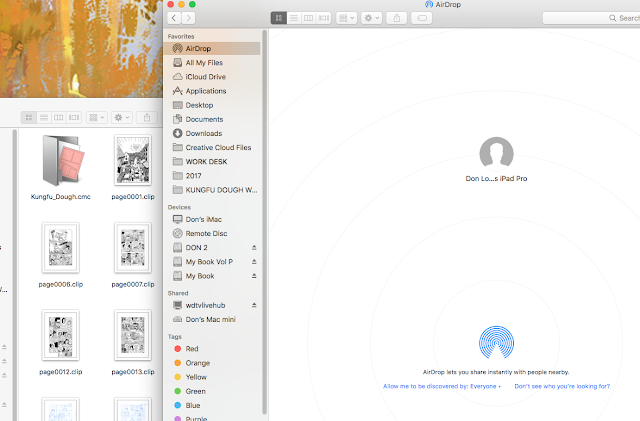 I used to use a external device connecting via USB and Thunderbolt adaptor, which works great too, but Airdrop saves the hassle of plugging in and plugging out. Once you accept the file on iPad Pro, Clip Studio opens it up automatically and you can start working on your file. If it doesn't, try importing again. Clipstudio saves the files in its own file directory (I have no idea where exactly is the root directory). To put back the finished file back to the Desktop on your iMac, click on the ClipStudio icon located on the top left corner of the UI. It will pull down a drop menu. Select "File Management". It will bring you to a Panel containing all your files. 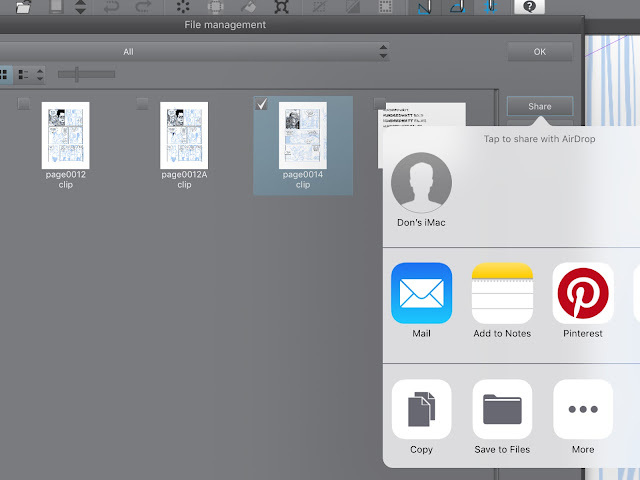 Check the desired file and then select "SHARE". Choose the location where you want to save the file. I chose my iMac via Airdrop again. Remember to accept it on your Desktop. These steps are entailed in the following images. 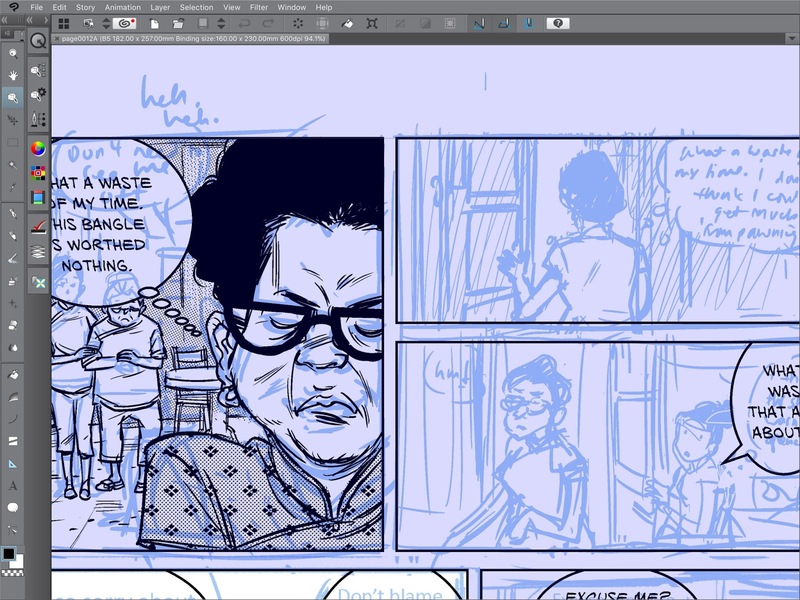 With this, I have no doubt ClipStudio is able to take over some of the major imaging software out in the market. 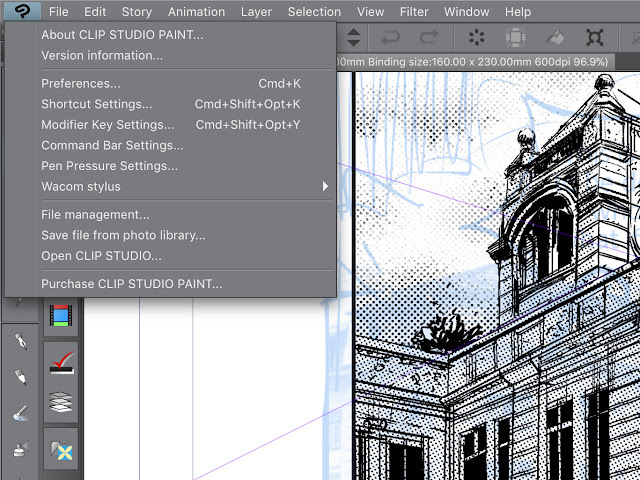 In fact ClipStudio has been able to perform better and you may be able to do more with the app. I have yet to fully run the app to test run its capability on my iPad. There are still many things to consider. For example, importing my favourite customised G-pen, or screen tones and etc. But I don't see a problem with these. There is just one thing. I need to import my purchased comics font into my iPad Pro so I could edit my text on my comics. 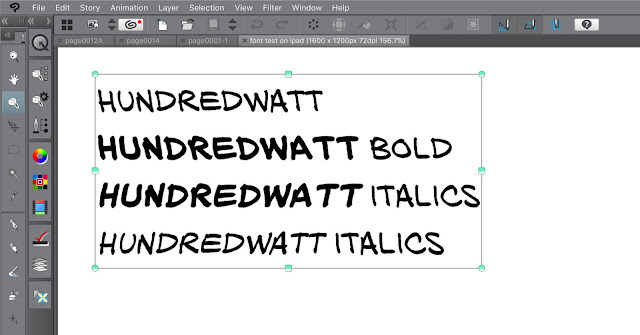 Currently I am using "HUNDREDWATT BB" for my project, a font I bought from Blambot. 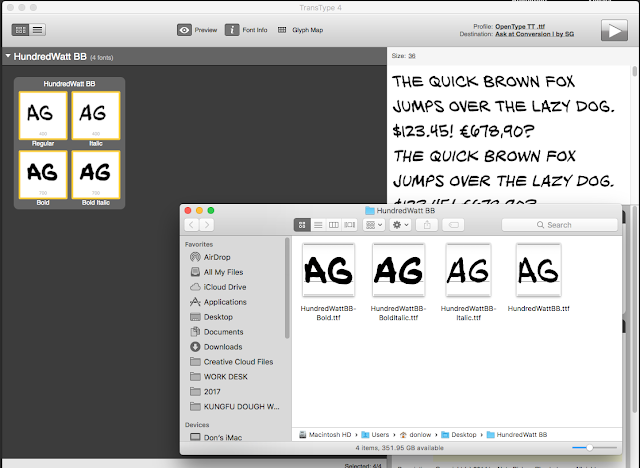 When I found the font package on my Desktop, to my horror it is in FFIL format - a pre-OSX file type. I have to convert it to Open Type or Truetype in order for me to use it on my iPad Pro. But before that I tried to re-download the font from the vendor but it told me my download link has expired. 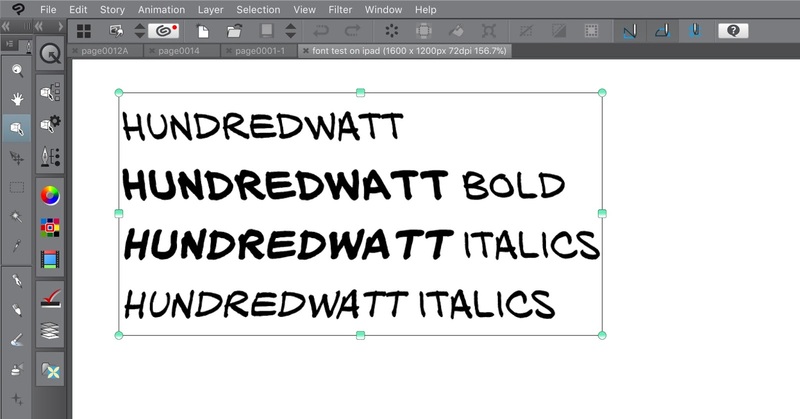 I bought the font way before when there was OSX on my older machine. I have to write in to the vendor to request for a re-download. 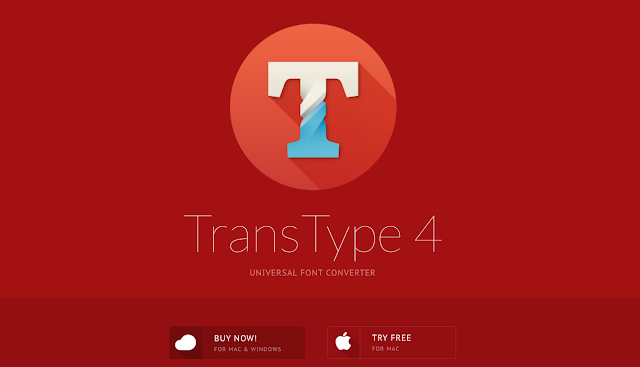 Refusing to wait, I found "TransType 4" after some reading up. 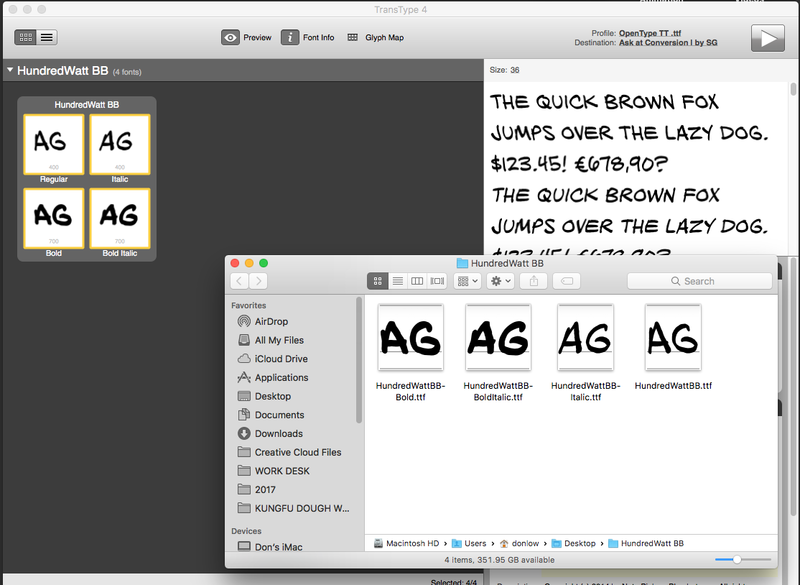 With it I successfully converted my pre-OSX fonts to TTF or OTF. 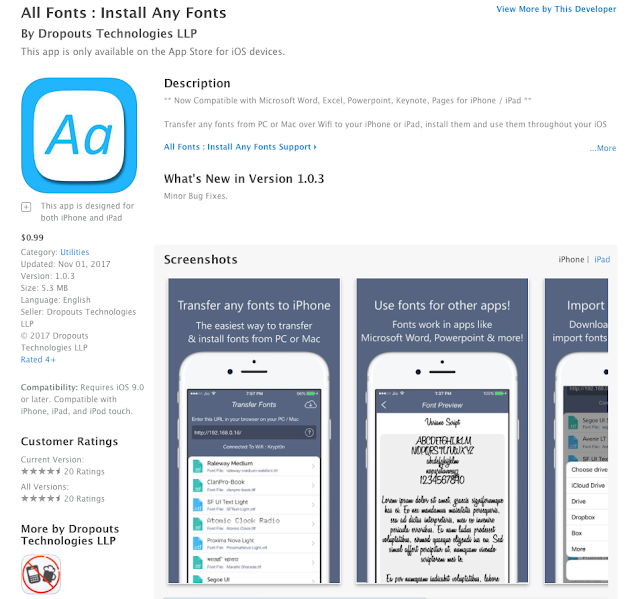 To import the converted fonts to iPad, I am using "ALL FONTS" that I got off iTunes. The app will provide you with an IP address that you key into the address bar of your Safari browser. However this method did not work for me. I simply Airdrop the fonts and save them into File system of the iPad (I used DOCUMENTS in this case), and selecting the Cloud icon on the top right corner of the UI to import the fonts and installing them. Here's a test of the fonts on my iPad Pro's ClipStudio. Up to this point, everything is good so far. At the moment, I am using the first gen iPad Pro which has a slower speed. So I am not sure how it will perform when I am working on multiple panels on ClipStudio, and how Apple Pencil would respond to ClipStudio. I will update in time to come. Have a great holiday!